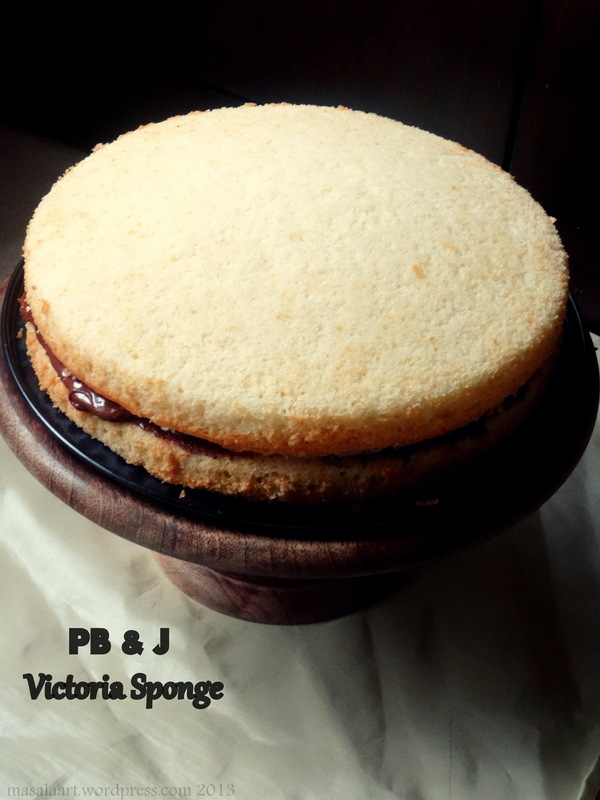 The classic Victoria Sponge has been on my to-do list for a while, and I don’t know how many times I have thumbed through the recipe in my copy of How To Be A Domestic Goddess. I made a practice cake last month just to test it out, and it was quite nice. Last week I was on a cake making spree. I used a lemon I found at the local market to make a quick lemon & vanilla loaf. I made a chocolate and olive oil cake. And then I set my sights on the Victoria Sponge again. After wasting two little small cartons of fresh cream and much sugar, I gave up. And then it struck me: why not ditch the cream for peanut butter? 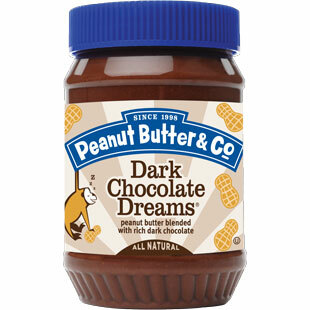 Especially since I had not just any old peanut butter, but Dark Chocolate Dreams from The Peanut Butter & Co? This PB is just amazing. A little more on the expensive side since it’s imported, but totally worth it if you enjoy and appreciate peanut butter like me. (I bought it on Foodesto.com- they have great products, wonderful service and deliver a large selection of their goods across India.) It tastes like a Reese’s Peanut Butter cup, in spreadable form. Delicious. And it’s not cloying. 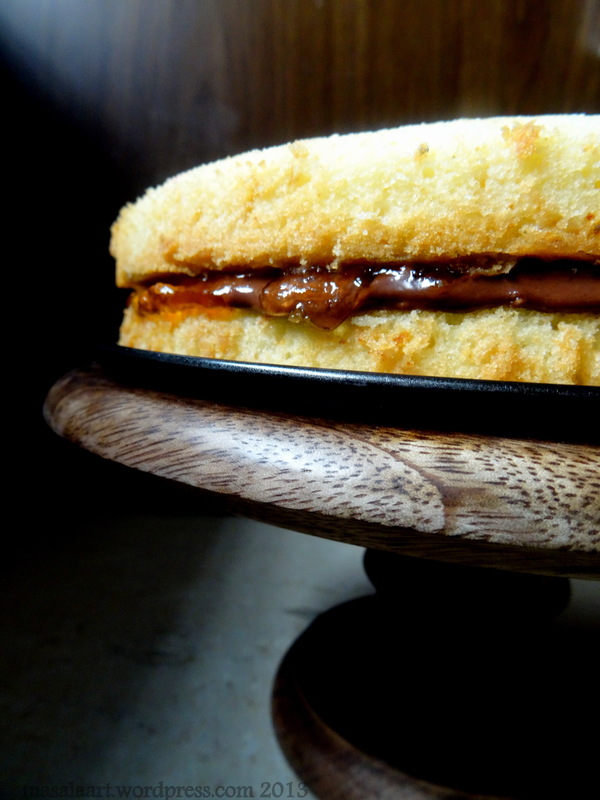 So this may be a bastardized (pardon my French) version of the classic British cake, but a little American peanut butter love does no harm to this soft and crumbly sponge. And I am going to be cliched and douchey and say that it transported me back to childhood. Technically, it shouldn’t; since peanut butter has been a steady part of my adulthood, but cake always brings out a little child in all of us. Line two 9-inch sandwich tins with parchment paper and keep aside. In a large bowl, whisk together the flour, baking powder and corn flour and keep aside. In a large bowl, cream the butter and sugar until the mixture becomes pale and fluffy. Add the vanilla extract, followed by the eggs, one at a time, adding a spoonful of flour between each egg. Once the mixture comes together, fold in the remaining flour mixture. The batter is going to appear a little thick and sticky, so pour in 3-4 tablespoons of milk to loosen it up a bit and bring everything together. Divide the batter equally between the sandwich tins and bake at 180C for 25 minutes or until the cakes begin to come away at the edges. You will know they are done when they are springy to touch. Place the second cake on top, upside down. Dust with icing sugar for extra effect. 1. Buy Amul (preferably the 200ml tetrapack) a day (or two) ahead and refrigerate it. 2. Taking care not to shake the tetrapack, gently cut open the top flap. 3. Scoop out the thick cream (which could even have higher fat % than heavy cream 😉 ) with a spoon into a bowl – you could take out all cream except an inch from the bottom – you would be able to see a little cream floating on whey. Looks fantastic!!! Domestic Goddess is my all time favourite cookbook. I love peanut butter & company! Yum!